Another in our ongoing series of occasional reviews of cigars given to us as gifts. Featured this time is the Ashton Cabinet Selection Belicoso, given to me by club founder Fernand back in March of this year. Produced by Tabacalera A. Fuente y Cia., it features a very light Connecticut natural wrapper and a well executed belicoso shape. The current Cigar Aficionado rating for it is 87 (Jun, 2006). Following Cigar Aficionado's 4-part rating system (Appearance & Construction, Flavor, Smoking Characteristics, and Overall Impression) I sat down to rate this cigar while enjoying a modified dark n’ stormy – ginger beer with Sailor Jerry spiced rum in place of the Gosling’s black rum. A very attractive light colored cigar, the Ashton Cabinet begged to be selected from the humidor as it stood out against its darker leafed brethren. With a nearly perfect Connecticut wrapper, the quality of the Fuente company’s rollers was readily apparent, with a firm but not overly hard texture and only the smallest of blemishes and veins present. Technically, the cigar is top-notch. While I started with a single clip of the head using a double-bladed guillotine, I opted for a second cut about halfway through which really opened up the airflow and gave the smoke some added volume, both of which weren’t necessary but were certainly appreciated in my enjoyment of this cigar. 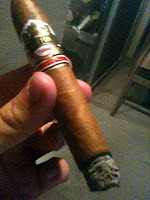 The ash clung tight for over an inch twice throughout the cigar, and seemed to easily turn an almost perfect white. I took this stick right down to the nub without a single technical flaw. Keeping in line with its mild flavor profile, the first two thirds of the cigar bring some light woodsy notes, as well as the occasional graham cracker or wheat cracker taste – certainly present but not overpowering, and easy to see why both are generally consumed with something on them as opposed to by themselves. The final third delivers a bigger punch of flavor, with some notes reminiscent of Champagne and Prosecco coming through, followed by a nuttier and smokier finish that I would have loved to see present throughout more of the cigar, hence my desire to get every last puff out of it. My rating for the Ashton Cabinet Selection Belicoso is 89. The Ashton Cabinet Selection Belicoso is a thoroughly enjoyable cigar, if a bit mild for my taste. Price not an issue, this is a pick for the fan of milder cigars, or for those new to cigars and looking for an introduction from a gentler taste perspective. Considering price however, this cigar seems to push the higher limit that most new to cigars would seem to tolerate, although cigar veterans might not object to paying for Fuente’s quality of work provided it fits their taste preferences. It certainly earned its Ashton mark of quality and would be a welcomed smoke in the future.